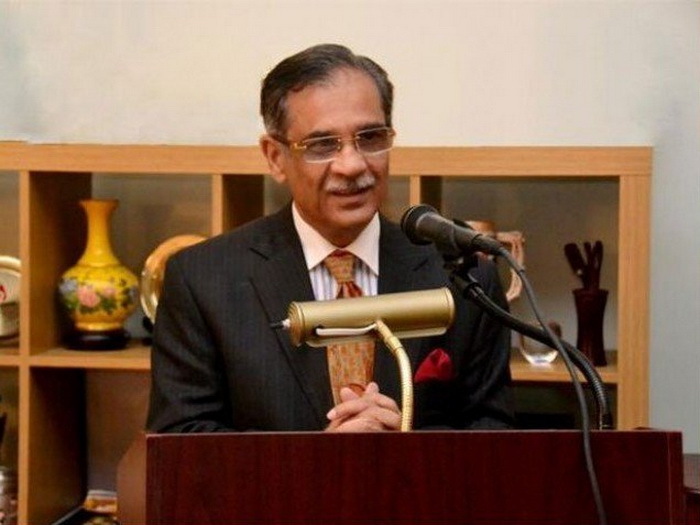 Home Chief Justice CJP warns dams’ enemies of action under Article 6. LAHORE - Chief Justice of Pakistan Justice Mian Saqib Nisar on Saturday warned that any person who attempts to hinder the construction of Diamer-Bhasha Dam will be tried under Article 6 of the Constitution. “Water is more expensive than gold now and we will not allow its theft,” remarked the CJP while heading a two-member bench hearing a suo motu case against mineral water companies. “Mineral water companies are paying the government [a meagre] Rs0.25/litre and selling it at [an exorbitant price of] Rs50/litre,” a lawyer representing the federal government informed the judges at the Supreme Court’s Lahore Registry. Water and Sanitation Authority (Wasa) managing director, who was also present in the court, added that “before 2018, mineral water companies were extracting underground water for free”. Justice Nisar had taken suo moto notice of mineral water companies’ using underground water for selling it in bottles on Friday, during the hearing of a case pertaining to environmental issues facing the Katas Raj Temple. The chief justice remarked that water was a precious thing and they would not allow its theft by anyone. He added that the “mineral water companies should determine a [reasonable] rate]”. He also remarked that “we will have to check if there are any minerals in mineral water”. “At home, I boil tap water and drink it,” he continued. “Even today, the poor are forced to drink water from ponds,” the judge added. The court then summoned chief executive officers of all mineral water companies and adjourned the hearing of the case until today (Sunday). Basha Dam is one of the two dams which the authorities have prioritised for construction and the CJP is spearheading the efforts for their construction. The other dam to be built at the earliest is Mohmand Dam. The chief justice on Saturday also hinted at the construction of Kalabagh Dam, though with the consensus of the all federal units. “We have not abandoned [the idea of] Kalabagh Dam (KBD) construction. After Bhasha and Mohmand dams, if national consensus is developed, KBD will also be built,” said Justice Saqib Nisar. Addressing a ceremony organised by Akhuwat Foundation for distribution of cheques of interest-free loans among the deserving at a mosque, he termed this dam a guarantee to survival and progress of the country in real sense of the word. Kalabagh Dam has been hit by political controversy over the last three decades, despite the fact the project has been found most feasible, cost effective and early to complete in the experts opinion. KBD will not only cater to the water needs of hundreds of thousands of acres of agricultural land but also yield 4500mw electricity at a low cost – less than two rupees a unit. The past governments failed to take decision on constructing KBD due to opposition by certain political parties. The PTI government also speaks gingerly on the issue. The chief justice said his efforts will not be limited to the dams. He recalled the time when he came across the issue of rapidly depleting water resources in Quetta about five months ago. At that time, he said, he learnt that if water dearth situation persisted, Quetta people will have no water and be forced to migrate to other places. “When I probed the matter deeply, I came to know that it will not only be Quetta but the whole country facing the same water crisis after a few years.” He said, upon it he invited the experts and placed the issue before them which enlightened him to the fact that the water situation would be so grave and threatening in future that it will become a matter of the very survival of the people. Justice Saqib said that construction of dams was found out to be the only solution to deal with the upcoming water shortage in the country. And then came the question that which dam should be built to meet the challenge, he added. Despite being one the most feasible projects, the KBD was not found out ready for construction [due to political controversy] and preference was therefore given to the building Basha and Mohmand dams, he said. Swearing on the sacred place he was sitting in, the chief justice said he has not given up construction of Kalabagh Dam. After Basha and Mahmand, KDB will also be built with consensus and national unanimity as this dam is one that guarantees survival and progress in the true sense, he added. Justice Saqib Nisar also appreciated public response to the fund raising campaign for dams and said this public spirit was not in his mind three months ago when the drive was announced. Fund raising has taken the shape of a movement wherein, he said, not only the grown up but the kids are showing unmatchable enthusiasm. He said even five year olds and students had pooled even such amounts as two and five rupees to share their bit in the dams fund. The CJP also mentioned Rs1.05 billion contributed by Pakistan Army, and Rs100 million by a group of companies. He said it may be possible that fund raising could not generate enough resources for the construction of the dams, but it will certainly be a positive share. He also lauded the contribution of one lakh rupees made by transgender persons. In deference to their spirit, he added one lakh rupees to their amount from his own pocket, the CJP said. Stressing on the importance of dams ‘movement’ for Pakistan’s national survival, the chief justice said that in his view every citizen of Pakistan was a custodian of this national interest and performing as a watchman on the matter of dams construction. The CJP on the occasion also highly appreciated the role of Akhuwat Foundation and its chairman, Dr Amjad Saqib. He was pleased to learn about the 100 percent return of Akhuwat loans and greeted the chairman on this success. - Nation.